Many of us have experienced (by choice or necessity) shifts in careers and goals that have required us to uproot and move to a new location. While relocating can often be a very positive and exciting experience, there is usually a period of adjustment as life settles down in the new surroundings. Many of our students have experienced such shifts in their lives and can make strong connections to the feelings of displacement that occur during this transitional time. If you are searching for a way to initiate a class discussion about moving and dealing with change, the following story might be just what you are looking for. The little girl in this story has just travelled by train from Saskatchewan to Toronto with her family. Her father has finished his job building a bridge over the Saskatchewan River and is now working on the construction of a highway across the city. At first everything about life in her new neighbourhood seems strange and she can’t help comparing the two places. There. We lived on a road. A graveled and oiled road, carved into the middle of the bush. A road without a name. Here. We live on a street. An asphalted and sidewalked street, paved into the middle of the city. A street with a name. Birch Street. I don’t see any birch trees. They must be hiding in the backyards behind the fences. Slowly the little girl adjusts to her new situation and finds a new friend. Here. Anne and me on our bikes-down our street, through the church parking lot, past the apartment buildings towards Yonge Street and lunch at the Red Barn— pedaling faster and faster. The Toronto air rushes to greet me, tugging up the corners of my mouth. Anne is smiling, too. Not the same as here. From There To Here is the sequel to the award winning book I Know Here. 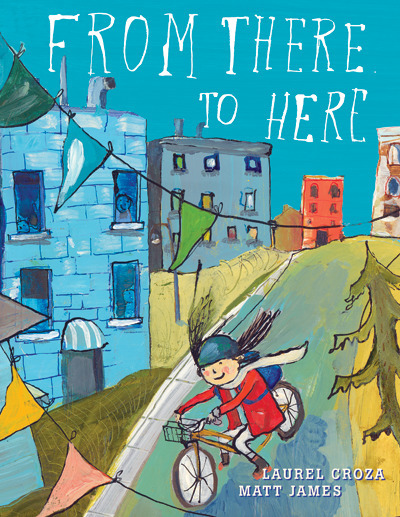 Set in Saskatchewan, this book deals with the little girl’s apprehension about moving away from her home there and her determination to preserve her memories of that place through her artwork. The following is a lesson that helps young learners to use their prior knowledge, as well as the information that they have gathered from the text and illustrations, to come up with a guess about what the story will be about. When making a prediction there is no right or wrong answer. There are many clues in the text and the pictures to help you. Predictions might stay the same, or they might change, when new information is added to prior knowledge. 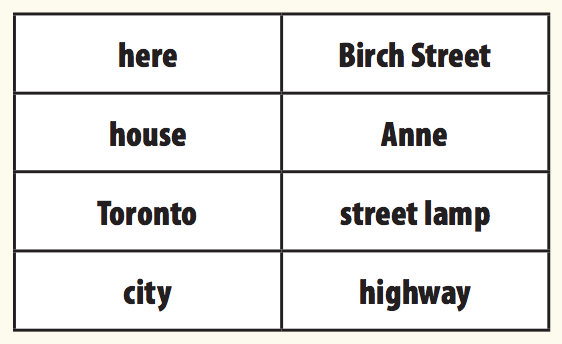 one copy of word sort #1 for each student: here, Birch Street, house, street lamp, Anne, Toronto, highway, city. 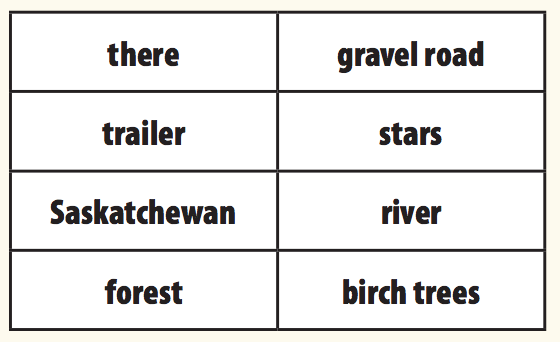 one copy of word sort #2 for each student: there, gravel road, trailer, stars, Saskatchewan, river, forest, birch trees. one pair of scissors for each student. Explain what a prediction is (using prior knowledge plus the clues in the book to make a smart guess as to what the book will be about). Explain that there is no right or wrong answer when you are making a prediction. Explain that a prediction can be altered if new clues are found in the story. Explain that today they are going to sort words from the story to help make a prediction about the book. Distribute Word Sort #1 to each student. Explain that the words were chosen from the text in the story. Read the words with the students and determine that they have the correct meaning for each one. Have the students cut the word boxes apart. Have the students do a closed sort (they sort the words according to the teacher’s established rule). They can do the sort on their desks or table tops. Rule: sort the words under the following headings – people, places, things. Have each student share their sort with a predetermined partner. Have each student justify their sort to their partner (explain why each word is placed under the chosen heading). Have several students share their predictions with the class. Distribute a copy of the second word sort to each student. Repeat the above sequence but mix the second word sort in with the first one. Sorting Rule: Sort the words under the following headings – here, there. Have each student talk to the same partner. Have them decide if their original prediction will stay the same or change. Have them justify their decision (“I am changing my prediction to…because…” or “I am not changing my prediction because…”). Show the book to the students. Read the title. Examine the cover illustration. Have each student talk to their partner about the prediction that they made with the two word sorts. Will their predictions stay the same or not? Read the story to the class. Have the students think about their predictions and the actual events in the story. Have the students share their thoughts about the accuracy of their predictions. Brenda has 35 years of classroom experience. She has presented workshops on literature based themes and literacy strategies, and has written a number of resources for teachers. She remains passionate about by Brenda Boreham matching up kids with books. This article is from Canadian Teacher Magazine’s Jan/Feb 2015 issue.